I rolled a rough coat of white over the sparkly gold painting. Elise added yellow to cover the birds. Then we mixed up a few shades of sky and grass. Spring colors. Preschoolers don't compose abstract art, but their natural style can look quite contemporary. 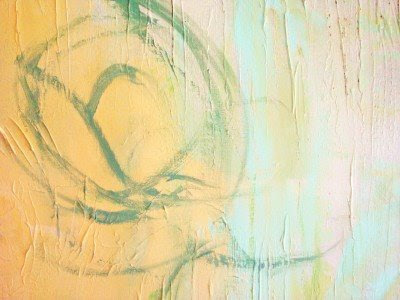 Elise loves to draw circles, so that's what she painted--smeared, overlapping, fast, slow. I loaded the brush, and she kept circling. After an hour, she stood back, surprised. "I painted bubbles! A world of bubbles!" Is it any better than the piece we painted over? Does it matter? I love its grand scale and the life it breathes into what is, after all, our living room. ...absolutely worth the mess. Every last drip. For a true story about the power of art and expression, visit the Journey With Grace: Autism, Art, and All The Rest Of Life. I love it! And Elise looks like she's enjoying every second of it:) You're raising real artists! Awesome! Your blog makes me so happy....i love your ideas! Fantastic idea! Small new canvases can be expensive...I'll have to keep my eye out for a large FRAMED canvas for the kids to paint over. I love it! MUCH better than the first, and so personal and special to boot! That is such a wonderful idea!! I love it... thank you so much for sharing! Love it!! The colors are beautiful with the yellow wall. It *is* huge. It didn't look that big in the first picture. A wonderful world of bubbles, painted by your very own artist. Love. Love. Love it! How special for your daughter. I love it, and I love the idea. It looks AMAZING on that yellow wall. Now I'll spend all summer hunting for ugly canvases. Did you use acrylic paint, or just latex on hand? You didn't mention priming -- did you use a primer? I like Elise's much, much better! What a great idea?! We just used house paint. First, we used a mini roller and rouhgly rolled a coat of white/off-white over the original painting. You have to be careful not to add too much new paint, or the canvas gets heavy and sags. You could still see the dark birds and their beady little eyes through the white, so I let Elise paint yellow in the center portion. Then we used a combination of some fifty-cent quarts of paint from Habitat and a tube of aqua blue craft paint on the remainder. And because I know someone is going to ask--I DID put an old shirt over her clothes after we did the yellow. We jut got so caught up in the momentum of starting that I forgot to protect her clothes. a bulletin board would probably have been a better idea, but this was a last minute idea based on what I had at home! Love Rhoda--she is the yard sale queen! Meredith-- THIS is why I love your blog-- you have the good humor to chuckle at the original purchase, and the head and heart to move forward and make this great moment and object out of it. Hats off to you, friend! I love it, and love that her first canvas is so much bigger than she is! What a creative repurposing. I loved these two posts!! After 20 years and 5 kids, I have come a long way in learning how to be relaxed, and not be nuts when things aren't "perfect". And what IS "perfect", anyway?? I laughed out loud at your first post because, trust me, I have family legend stories about rash,silly stuff I have done that no one will ever let me forget about! But you tell Elise that we think her picture is BEAUTIFUL!! My five year old, Emily, was looking over my shoulder as I was reading and exclaimed, "That's pretty, Mama!" Enough said! There must be something wrong with my computer. The last three posts have shown up a day late! The Easter post didn't appear until Tuesday, and the Tuesday posts only today....Anyway, isn't it amazing the creativity chldren display? I think it is because they have no hang-ups or fears, they just really let loose! It's nice. What a beautiful transformation! How good of you to "recycle" something into a wonderful masterpiece that your family can be proud of! I absolutely love it!! What a great idea and you can always change it again if you want. oooh. Doing this next month when I take off the slipcovers, and change up the color palate in my living room for spring/summer. She did a fabulous job! I think that looks wonderful with your walls, and you improved on the original. Your daughter has a lot of talent. I am so glad you let her paint a picture to hang in your home. That is a blessing to a child to know that they are appreciated and that she spent some one on one time with you. I think Bubbles is a fine name. Are you going to let her daddy hang it in his office or will it be in your beautiful home? It looks like you just left it in the frame, so did you paint the frame later? The frame looks pretty good in the "done" picture. And did she sign her name and date it? Because it is absolutely precious! I am, like everyone else, blown away with your originality. Thank you for showing us how it's all done. I remember you doing something similar with your son--such a fantastic idea! Elise's painting really does look wonderful. What great memories were built with this fun project. Also, by using the house paint you already had, you ensured that no matter what your little artist did, the colors would "go" with the room. It looks great! FABULOUS idea!! I'm sure Elise loved it. Was Andrew envious of her chance to paint on a big canvas? I think I would need 2 canvases to avoid a major battle in this house! That was not what I was expecting.. but, wow, it is so perfect... If I were you, I wouldn't take a million dollars for it now... I hope you put her name, age, and date somewhere on it... I love it!!!! I think it's beautiful, a treasure for your family and do I even have to say it? A vast improvement over what was there. Great idea to paint over it. I love it! That is exactly what I would have done... I am looking for a big piece for over my piano, do you think the guy will deliver to Maryland, lol! It looks great! I have purchased oversized canvases at garage sales to paint over, myself! I THINK THIS IS GREAT! PEOPLE WILL NEVER BELIEVE SHE DID I! I THINK IT'S WONDERFUL. So gorgeous!!!! What a fantastic idea...absolutely amazing. Well, what do you know?! You just might be raising a little modernist. Great job, Elise, you've created a masterpiece of which you can be proud. That's better than some of the art I've seen in museums, LOL! What a wonderful idea! What an awesome picture! It could be one you bought for thousands of dollars...seriously. What a neat thing to do! Oh my gosh, I knew as soon as I saw your post with the ugly birds this morning that you had something fantastic up your sleeve!!! It is absolutely beautiful and I couldn't agree with you more about what a great job Elise did. 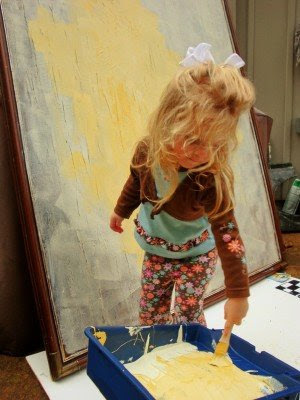 That is beautiful.....and a real confidence bilder for the little artist.....what a great mom you are! This is one of your most beautiful posts! Everything about is beautiful. From your gorgeous little artist-to the idea of a world of bubbles! Also, ridding the world and your garage of an ugly thing is also wonderful! I love it!! 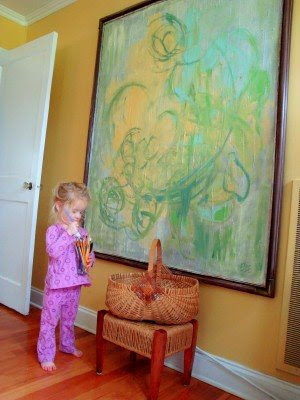 How special for her to have her painting hanging in the living room. Perfect! It can always become a bulletin board some other time. That revamped painting would sell on Craigslist for $1,015, Meredith! The expression/process/giggles I know = all priceless! GO, ELISE! You've brought me joy today through your lovely art! and now... your best craigslist purchase ever. This is just fabulous. Way to go Elise! This looks very much like what we did with a yard sale frame and some paper purchased at the art store. I think the key to getting something you'd want to put on your wall is choosing the colors and not allowing the child to load up their brush too much. =) This looks WAY better than the birds. I think I spent $15 on the painting? I can't remember the original price, but she offered to take half and drive it all the way to my house from an hour away! OH MY GOODNESS...I love that!!! LOVE IT! It was pretty bad. But now? Fabulous! A fun day, a colorful accent, and great meaning behind it! Now that is art! What a great idea. Meredith, thank you for sharing your creativity via this blog and blessing us with your inspirational frugal beauty. And most of all, thanks for including my daughter, Grace Walker Goad's, art in your post's bottom link! You are so thoughtful. I adore the colours Elise chose. Perfect for a worl of bubbles. Meredith, the after-product is fabulous! I can see your idea being copied by some HGTV design show! My 13 year old and I will be on the lookout for a large, ugly painting this yard sale season so make our own special, one of a kind art! Elise must be SO proud! I really like the picture that Elise made sooooo much better then the birds. I think that painting is gorgeous! No one would ever guess a child painted it, and it will be a great heirloom. Don't know why, but this made me tear right up! But, I cry at commercials too. Wow, I am speechless! It is beautiful! Wow - that is awesome! Great idea! And I'm so glad you could recycle the ugly old into such a beautiful new work of art from your own family!! Brilliant!! Absolutely brilliant!! I love it! So beautiful! I think Elise should open an Etsy shop soon! Her painting is better than most grown up abstract paintings. ;-) I'll have to try this with my children too. I really really really love it and would hang that in my house without a doubt! Good job! WAY better than the original. Such a great idea. Thanks for sharing. Such nice comments on these posts...I am laughing as I sit here reading these, thinking, every single large ugly painting at garage sales this spring will be suddenly bought up by all of us LMS readers! My seven year old, Alex, draws non-stop, so I think I might try and let him do something like this. He would love it. We have TWO large townwide sales in neighboring communities this weekend, so we might put a "large ugly painting" on our wish list! Awesome! I would be proud to hang that in my home! What a great idea and what a great mom! She will forever be proud of that painting! It looks a million times better...I would hang it in my home! Absolutely beautiful idea!!! Thanks for sharing! Meredith I suspect that is the world's most transforming make over of a painting, ever! Your daughter has quite a flair. That is such an awesome idea!!! Amazing! You are the best Mom!!! It is beautiful. I love seeing how calm children are while painting! When my four usually boisterous children are painting, you can nearly hear the brush strokes they become so consumed with it. She did such a good job. What a transformation! Now I regret getting rid of an old painting. I need to check our garage for reusable canvases! Elise's hair is getting so long!! And, I concur with what EVERYONE else has said!!! It is lovely and what a great memory for your sweet little girl. Props to you, Meredith. It's beautiful. What a delightful little artist you have there! That is so creative of you--What a great idea! What a beutiful idea. What lucky kids they are to have a Mom like you! that is absolutely superior in every way to the work that lies under it! it could hang in an art gallery! Oh my word! That is beautiful. How proud sweet Elise must be...and you always rock it! It's beautiful! I think it looks way better than the original. :) Great idea. Now I'll have to be on the lookout for a giant canvas. Oh, that is BRILLIANT, Meredith! You constantly amaze me! I LOVE THIS! It's definitely going on my "things to do with my daughter" list. Oh my - I am amazed. You have an artist in the family. This made me smile. Everytime you look at it you will smile. Oh my goodness - that is so great! It's adorable and precious! And just think, her very own masterpiece. It's so huge - it looks way bigger in that picture than in the first post.... definitely too big for a bulletin board - LOL! :) I can see this as a changing canvas... when any of you or Elise tire of it, she can paint another masterpiece! I love taking trash and turning it into a treasure, how creative in thought and what a wonderful memory for your daughter!! Well, aren't you a smartie!! It looks so much better. Good for you and your daughter probably feels great helping to make the new masterpiece. I think it looks great! I love the colors you chose, and Elise did a wonderful job utilizing the space. awesome. i love it. the painting and the idea. thank you and kudos to elise. I absolutely love it! It is beautiful! And you've put it in a perfect place! Great improvement. And there were memories made and fun to be had. What more could you ask for? I hubby going to put it up in his office? What a wonderful idea! You and Elise will cherish her painting forever! It looks like those you see in galleries for a fortune! That is awesome! Such a great idea! That is beautiful and I'm sure Elise loved creating her bubbles. I teach preschool and I love their paintings. I should bring an old canvas picture to preschool and have them paint over it! Just stopping by from Nesting Place - love this. It makes me very happy! I love it and it would have cost a fortune from a gallery! I absolutley love it!!!!!!! I would love to have that in my bedroom. So relaxing! It's perfect! What a lovely home to grow up in! I'm smiling huge. The new painting is just beautiful. I am a fan of children's art and feel they should be framed and hung. Wow - this is big scale - fantastic. You are a genius!! And she did a fantastic job - that thing is gorgeous!! I love this idea. I might just have to let the blessings try this! Thanks! R.
Ohhh....Meredith...you so inspire me...in soft gentle ways. Thanks for being you. This is so amazing! And gorgeous! Thanks for a great idea!!! I'm waaaayyyyy behind in my blogs, but I had to stop by and give you a belated two thumbs up on this transformation! Amazing and so creative! This is lovely! What a great idea! Hey, that is very cool! I love this idea. And the finished product is spectacular. so freaking perfect!! I am DYING to know how much you paid for that from craigslist. I am a HUGE craigslist person and I know it varies from city to city - and am so so wondering how much a painting that big went for. Pretty please - share with us.